February 2nd marks the midway point between the Winter Solstice and the Spring Equinox, a time of late winter’s loveliness and looking forward to spring. If you’re Christian, you might know this time as Candlemas, the feast of purification of the Virgin. If you’re American, you might know it as Groundhog Day, where we place the power of divination on whether or not a furry little critter sees his shadow or not and how that relates to the length of winter ahead of us. If you are Pagan or have Gaelic roots, you may know this day as Imbolc. Whatever your background and whether or not you celebrate, there are a few symbols that seem particularly poignant in the early days of February. 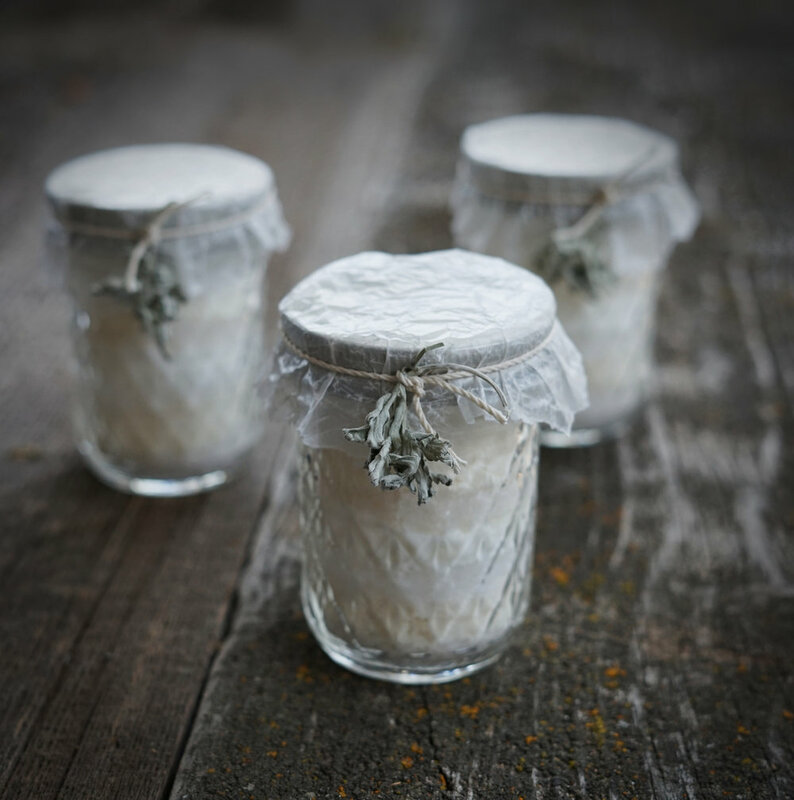 Cream, milk, and soft cheeses feature heavily in traditional Imbolc celebrations in Europe. In fact, the title “Imbolc” derives its name from the phrase Oimelc, or “ewe’s milk.” This is because it’s tied to the beginning of the spring lambing season and with new mothers comes new milk. After a long winter, this new blessing was deeply nourishing, especially to the very young and very old. Imbolc is also a time of purification and cleansing after the festivities of Yule. It’s time to shake out your closets and clear space for new beginnings. Spring is just around the corner, and Imbolc reminds us of that while gently nourishing as well! The whiteness of new milk and snow is associated with the sacred and the pure, as well as the magical. Gathered around a table lit with candles, we can see how the whiteness illuminates the last few days of winter and allows us to look forward to brighter days ahead. When you think of the wheel of the year in regards to age, you can see clear associations throughout cultures and throughout seasons. Spring is the time of youth and fertility. Summer is about responsible working and family ties. Fall is about the bounty of our lives, aging gracefully and sharing our wisdom with others so that they too may prosper. With winter comes old age and death as the earth is still beneath the snow. But with death comes re-birth, so this time of the year would represent the very young, the little baby lambs first entering the white world. It makes sense (to me at least) that we’d all be craving some of the gentle nurturing that is reserved for the youngest and tenderest amongst us. But no matter your age, an evening celebrating gentle self-care always feels sweet and lovely. Unlike many other Pagan celebrations, Imbolc is not a spring or fertility celebration; rather it honors those very first breaths. That slightly warm day that has you thinking about gardens, that first squirt of milk into a pail in the barn, the first little green sprouts making their way upwards under the snow. Even if there are still feet of snow on the ground where you live, it’s the sense that spring is coming. Even through the strata of ice crystals you can feel it… a gentle awakening, a miniscule stirring. When I have lived in snowy climates, I’ve treasured the potential of this time of year. I loved seeing snowbanks melt away, leaving a glimpse into the layers of many snowfalls that comprised them -some dense, some fluffy, some dirty, some clean. When I was a kid, I would dig the snow off of my plot of garden (kindly depositing it on my sister’s instead) in the hopes that spring would come that much faster to the earth I couldn’t wait to play in. Now, I still feel those tingles of impatient anticipation, but I have learned to relish in them. There is so much beauty in the slow build up, don’t you think? I like to mark this special day by taking a luxurious milk bath, honoring the first signs of spring and richness while thinking about the snow outside my window as well. Milk baths have strong connotations of comfort and motherhood, from the legendary milk and honey baths that Cleopatra herself bathed in to the trend to take maternity photos in a flower and milk-filled tub. Unlike many other ceremonial baths, this bath is not about purification, or setting intentions, or inspiring change. Instead, it’s about the pure pleasure of the experience, the sweetness of a rich milk bath on a late winter’s night when the ground, far below you, is just starting to blink sleepily. 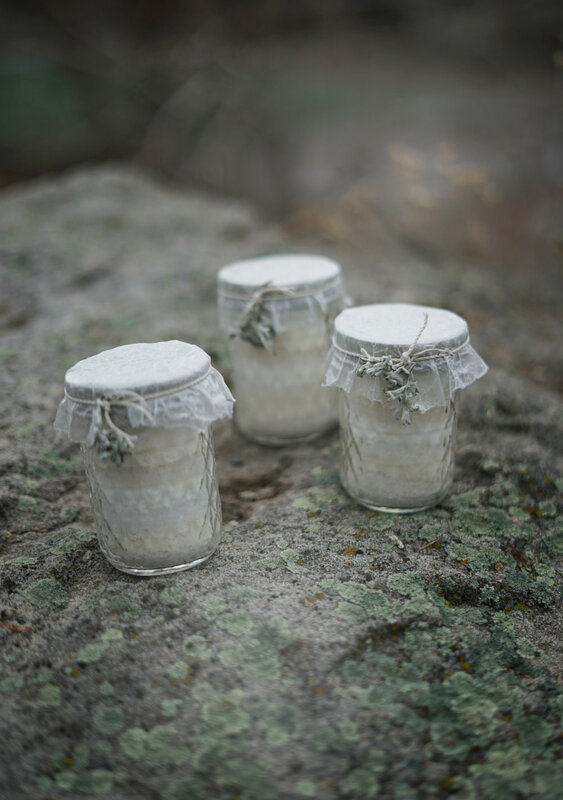 This milk bath is beautifully packaged in subtle white layers in crystal-cut jars. To make it, you simply mix the essential oil drops into the substance they are listed with, taking care to make sure they are dispersed evenly. Then, layer a couple of spoonfuls of each mixture into each jar, then top with the next mixture. Repeat the process until the jars are filled. I used coconut milk powder both for its luxurious texture and sweet fragrance and because I am allergic to dairy. You could certainly substitute whole milk powder instead, though. The scent combination holds the sweetness of this time of year as well: birch sap just beginning to flow with its sweet scent, plenty of balsam fir needle reminiscent of the conifers that hold our attention in the winter, and a base of sweet orange to balance it all out and provide and uplifting and cheerful counterpoint to the blend. (Sweet orange and conifer has become my favorite combination since my massage therapist started using it for my treatments. I find it so uplifting!) Baking soda, sea salt, and epsom salt work together to relax, soften, and soothe tired muscles. Together, all of these ingredients work in harmony to create a jar perfect for gift giving and a bath that’s perfect for relaxing. Optional: Tie on a little mugwort, which can be added to the bath, burned as incense, or tucked under the pillow to promote intense deep dreaming. Mix each essential oil into the material it is listed with until it’s completely and evenly mixed. Spoon each mixture into the jar one-by-one, layering as you go. Fill to the top and top with a screw-on lid. Before you take your bath, set the mood by lighting lots of candles. Turn off any other lights and let the flames illuminate your space. Maybe put on some gentle music. 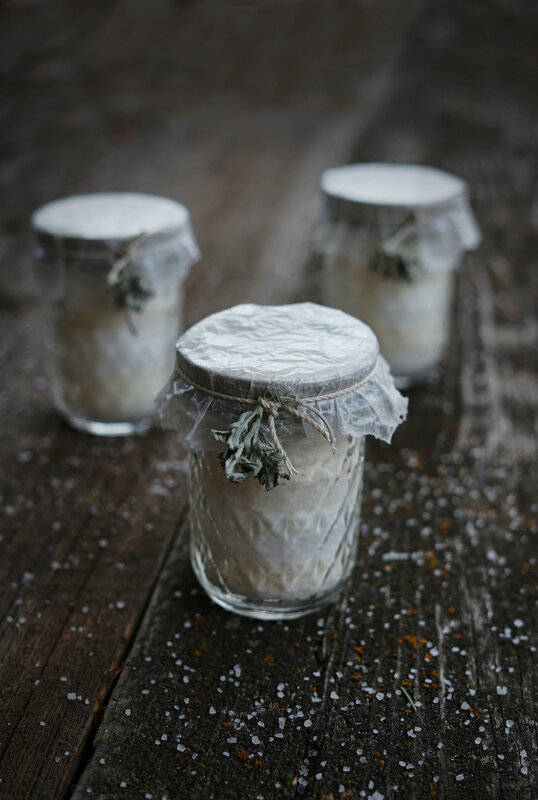 Run the bath with comfortable warm water and add the contents of one of your Milk Bath jars to dissolve in. Let your nostrils fill with the captivating scents the water releases. If you’d like, you can follow the directions here for increasing lymphatic flow before bathing. Step into the creamy, warm water, and allow yourself to just melt. Lay back into the cloud of scent your bath mix has released, and just breathe. Breathe slowly, at a pace that feels comfortable and relaxing to you. Notice how your body lifts in the water with a deep inhale, and sinks slightly as you exhale. In (float), out (sink) and repeat. Breathe slowly and evenly and notice how your heart, too, settles into a comfortable new rhythm. Let your mind clear, your focus drift. Focus on the sensations of your body, the warmth touching your limbs and core. Close your eyes and become present. Picture any areas of your body and mind that feel dark or cloudy. Focus on them, one at a time, and picture the water gently carrying them away, replacing them with bright white healing light. Notice how much lighter and softer you start to feel as that healing white light enters you. Open your eyes and gently stare at the flame of one of the candles. Let your attention become lost in it, entranced. Don’t focus on any other thoughts, just let them come and pass like clouds in the sky. When you feel both focused and deeply relaxed you can close your eyes for a few moments, then get out of the bath and dry off with a soft towel. Throughout the process, treat yourself with the love and patience that you would treat a small child with. Let yourself feel young and vulnerable. Let yourself be nourished by your own care. Spend the rest of the evening doing something peaceful and enjoyable, like watching a favorite old movie or diving into a good book. You may also feel like journaling about your experience.